Spend an afternoon in Kew Gardens and you just might leave with a new hobby, heightened appreciation for nature and a taste for German food. The neighborhood, near a 500-acre NYC park and landmarked cemetery, offers an urban-meets-suburban vibe. Just 45 minutes from Manhattan via subway, it's a great escape from busy streets and your day-to-day routine. But if you're not one for long commutes, consider taking the LIRR. It'll get you there in just 20 minutes. From what to eat to where to catch a movie, here's how to spend the day in Kew Gardens. The first thing you should always do when visiting a new place is scope out the best coffee and bagels -- especially if you're starting your day trip in the early morning hours. 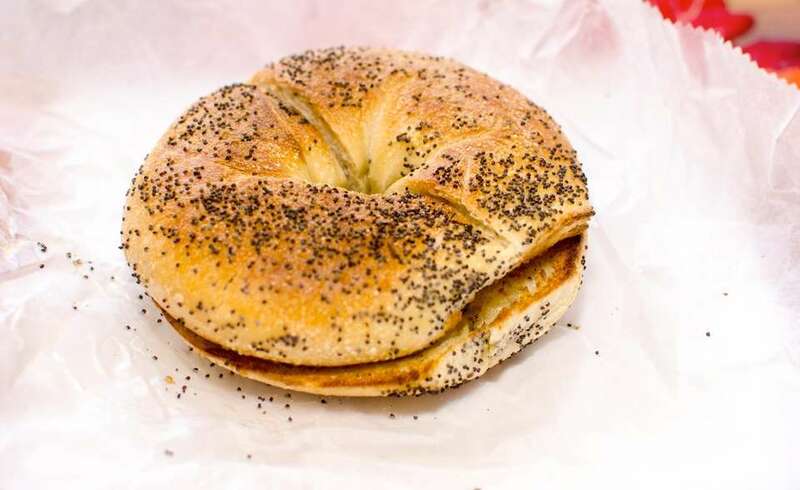 In Kew Gardens, Baker's Dozen Bagels, 81-09 Lefferts Blvd., is your best bet to provide that jolt only the perfect mixture of caffeine and carbs can provide. It's only a short walk from the LIRR station, so you won't have to travel far to get your morning boost if you choose that mode of transportation. If you're really, really hungry order the Hungry Man special: three eggs, home fries, French toast and a bagel served with coffee or tea for $10. Maple Grove Cemetery, on the eastern side of Kew Gardens, isn't just 65 acres of beautiful greenery, ponds and hills. It's full of history, too. The cemetery, established in 1875 and added to the National Register of Historic Places in 2004, is the resting place of many notables, including Rock and Roll Hall of Famer LaVern Baker and singer Jimmy Rushing. Unwind from the day with a leisurely stroll through the grounds, at 15 Kew Gardens Rd. You're already wandering a new place, so why not experiment with a new hobby? Try your hand at pottery making at the Potter's Wheel, 120-33 83rd Ave., and bring a new bowl, vase, plate or cup back home with you. Owner Grace Anker offers private one-hour introductory to wheel-throwing and hand-building classes for up to four people weekly. There are also public classes suited for beginners on Mondays from 10 a.m. to 1 p.m., Tuesdays from 7 to 10 p.m. and Saturdays from 2 to 5 p.m.
Go to Queens and bring back a German specialty. Homestead Gourmet Shop, 8145 Lefferts Blvd., sells a vast variety of German and Polish dishes, breads, pastries and treats. The shop has been around for 70 years and has been under owner Teresa Wianecka's management for the past 15. Everything is made fresh on site, Wianecka said. "We even make our own mayonnaise." Homestead's most popular items are the cherry, apple and cheese strudels, she added. If you're more interested in eating than shopping, stay for lunch and order the potato pancakes (seasonal) or a sandwich stuffed with meat sliced on site. A walk through the neighborhood will leave you questioning your own life decisions -- wondering why your bank account isn't loaded with enough cash to purchase one of the beautiful homes found in the area. From Park Lane at the southeast edge of Forest Park, head eastward on the windy Abingdon or Beverley roads for the perfect daydreaming path. Burn off lunch with a little nature admiring while you walk along the trail at Forest Park, on the western edge of Kew Gardens. If you enter off of Metropolitan Avenue, you'll be right near the park's four walking paths. If you're not feeling particularly adventurous, take Strack Pond Trail. The quarter-mile-long path takes you along the scenic pond. If athletic is your middle name, take the Orange Trail -- a 2.4-mile hike that will take you through most of the forest. You wouldn't go on a day trip and leave your BFF behind. There's a dog run in Forest Park right off Metropolitan Avenue, where Fido can make new friends or just lounge around and enjoy the space, like Archer, pictured. All of that walking has probably left you hungry. Stop by Hangar 11, 119-11 Metropolitan Ave., to satisfy your cravings. The menu is loaded with area-themed burgers, like the JFK, a bacon burger with Cheddar cheese and caramelized onions, and the Newark, a turkey burger with turkey bacon, mozzarella and grilled onions. If you opt to try Hangar 11 for lunch instead, order the Cuban sandwich with fries. It's only $9.95 from 12 p.m. to 5 p.m. Monday through Friday. Stepping back in time doesn't have to require much imagination at this independent theater. Kew Gardens Cinemas, 8105 Lefferts Blvd., is housed in a building that's been around since the 1930s. With Art Deco designs on the exterior, there's even an old-fashioned ticket booth window accessible from the sidewalk. Forget current-day films and catch a Shakespeare screenings, like "The Royal Opera House: Otello." Head to Austin's Ale House, 82-70 Austin St., for a drink after your movie -- it's right across the street. There are 20 local and commercial beers on tap. Brooklyn Brewery's Brooklyn BLAST! currently holds the title as most popular among the local brews, Johanna Cassidy (pictured), who has been a bartender at Austin's for more than 20 years, said. Worrying about catching a big football game? You can catch the game on TV screens at the bar and give your wallet a break with game-day deals, like 35-cent wings and $4 drafts and shots. The restaurant-bar has been a staple for Kew Garden residents for 25 years, manager Colleen LaRusso said. The spot, of course, also has its popular fare -- Shepherd's pie empanadas with chimichurri dipping sauce are a favorite. But, "every night of the week, customers can try a different special," she added, from Monday Muscles to Taco $2sdays. Don't forget to visit the historic Ralph Johnson Bunche House while you're wandering. The landmarked neo-Tudor style home, 115-24 Grosvenor Rd., was built in 1927. Bunche, a significant voice in the racial equality movement, became the first African-American to be awarded a PhD.in government and international Relations from Harvard University in 1934, according to the home's landmarks preservation report. In 1950, he became the first African-American to win the Nobel Peace Prize. Also worth visiting: The 1950s Redbird subway car by Queens Borough Hall, 120-55 Queens Blvd. The car, which served as a tourist center until 2015, is located on the eastern end of 82nd Avenue. Explore 34 new-to-you neighborhoodsCheck out Bushwick, Morningside Heights, LIC & more neighborhoods. Bayside, Queens: What to do and eatGo for a stroll along Little Neck Bay. Explore Jackson Heights: What to do when you get thereChow down, stock up on South Asian groceries and dance the night away.